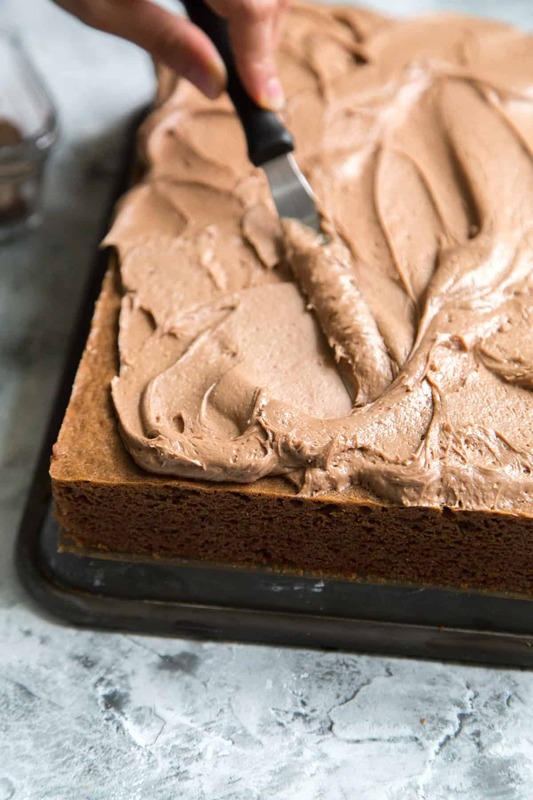 Ideal for parties and celebrations, this chocolate malt sheet cake is easy to make. The flavorful chocolate cake is topped with chocolate malt buttercream. Cake. It’s what’s for dinner. And breakfast. And possibly lunch. It can be difficult making cake in a two person (and two dog) household. Unless I’m specifically making the cake for a party or celebration, Alex and I are going to have leftover cake for a few days. Instead of making my usual layered cakes, it’s time to explore the world of sheet cakes. Single layer sheet cakes are much easier to share. Slice, plate, and send it off. Sheet cakes still look presentable and pretty once it’s been sliced. The same cannot be said about most round layered cakes. 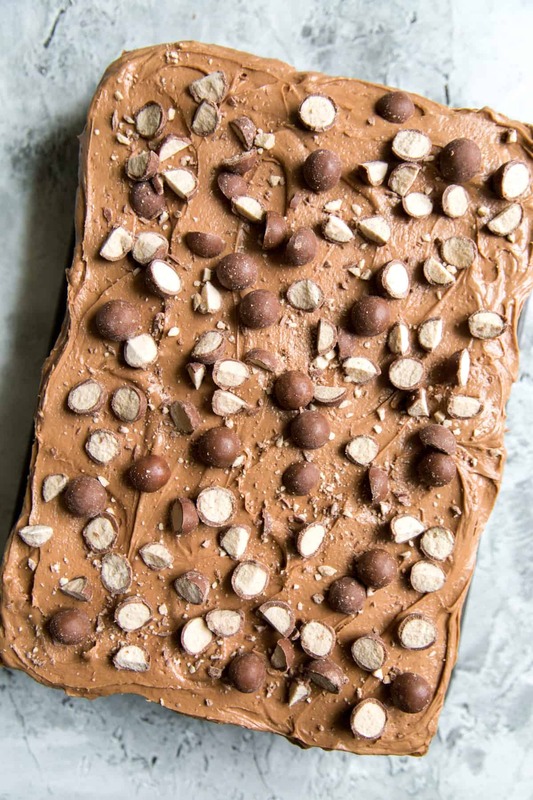 This chocolate malt sheet cake was created to be shared. It’s an egg-less chocolate malt cake, frosted with chocolate malt buttercream, and topped with a box of chopped up Whoppers milk chocolate balls. You read that correctly. This cake recipe contains no eggs. The recipe is adapted from What to Bake and How to Bake It. I’m always intrigued and fascinated by new ways to bake things. The exclusion of eggs makes this cake a bit more crumbly than most cakes. With a little chocolate malt buttercream on your fork, you can easily scoop up any cake crumbs that try to escape. This cake tastes like childhood. Alex and I both grew up enjoying malted milk shakes and glasses of super cold Ovaltine. Malted milk powder is generally made with wheat flour, malted barley, and milk powder. It’s a subtle yet distinct flavor. 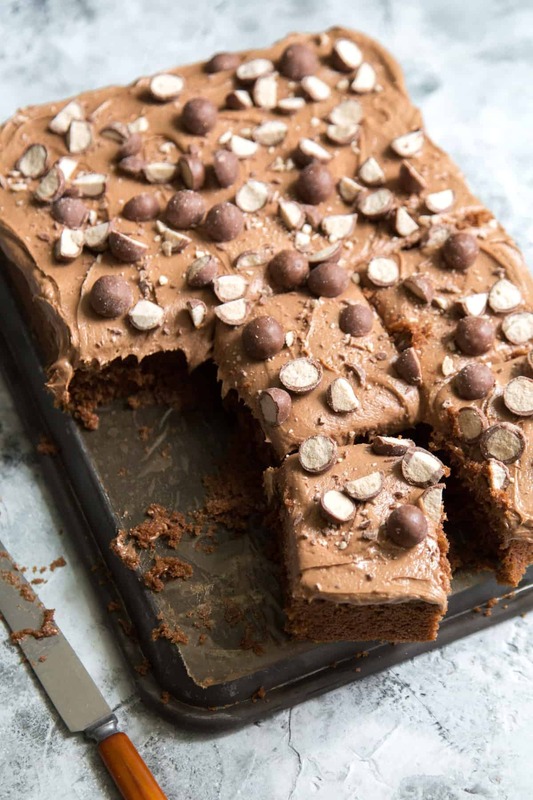 If you like Whoppers or Maltesers, this is the cake for you! I really want to make Milk Bar’s Chocolate Malt Cake. It’s a chocolate cake soaked in Ovaltine and topped with malt fudge sauce, malted milk crumb, and charred marshmallows. It’s a rather time consuming cake. It’s on my to-do list this summer. 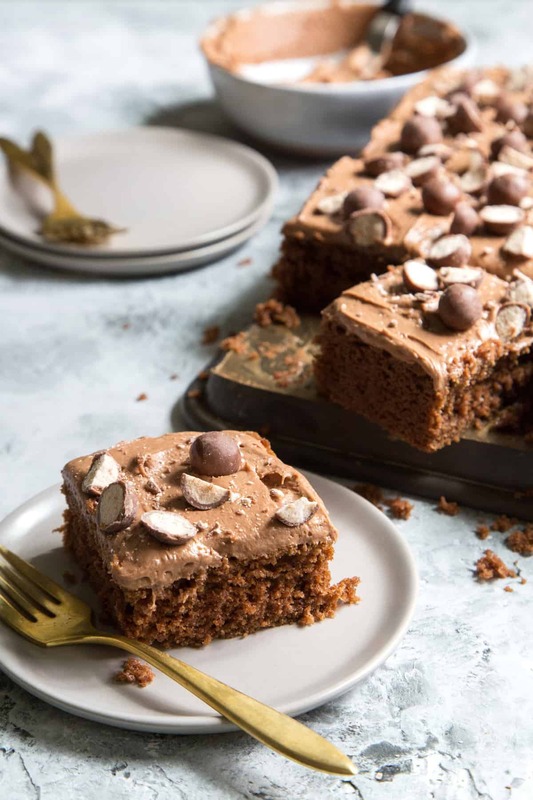 In the meantime, I’ll happily take another slice of this super easy chocolate malt sheet cake! Preheat oven to 350 degrees F. Line 9 x 13-inch baking pan with parchment paper and generously grease. Set aside. In a large bowl, sift together cocoa powder and malted milk powder. Add flour, baking soda, baking powder, salt, and sugar. Whisk together. In a small bowl, combine melted butter, milk, oil and vanilla. Add to dry ingredients. Use a sturdy whisk to mix together. Continue to beat until mixture is smooth. Transfer batter to prepared baking pan, spreading into an even layer. Bake for 30-35 minutes until toothpick inserted in center of cake comes out clean. Allow cake to cool in pan for 10 minutes before unmolding. Allow cake to cool to room temperature on wire rack. Using a hand mixer (or stand mixer with paddle attachment), beat butter until smooth. Add half of powdered sugar. Sift together malted milk powder and cocoa powder and add to mixing bowl. Mix on low speed until combined. Add milk, vanilla, salt, and remaining powdered sugar. Mix until smooth. Scrape down bowl as needed to ensure thorough mixing. 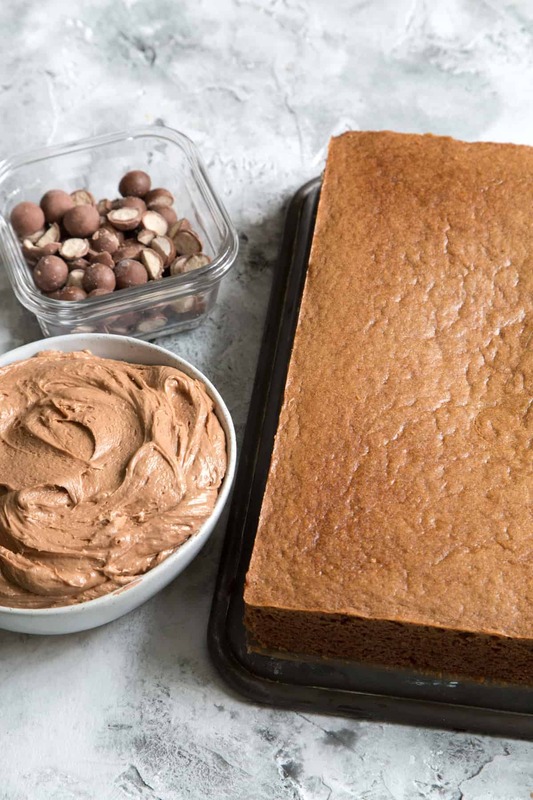 Spread buttercream over cooled sheet cake. Top with chopped chocolate malt balls, as needed. who needs presentable cake, so long as it’s tasty cake? (; i still haven’t made a momofuku-style cake, but that’s definitely on my summer list too. it sounds like fun but already thinking of the mountains of dishes lol.